Comedy in Literature essays examine pieces of literature that contain humor intended to produce laughter. Comedy in literature research papers look at the many different types of literary comedies from world literature to contemporary American literature. Paper Masters writes any type of literature research paper needed. Comedy is defined as any attempt at humor, intended to produce laughter. While many modern ideas of comedy come from stand-up, television, or movies, there is a long tradition of comedy in literature. Comedy derives from the ancient Greeks, who used the term to describe plays that had happy endings, in opposition to tragedies, which had sad endings. The Greeks developed comedy out of satyr plays, which were filled with ribald and bawdy songs and recitations. Aristotle wrote a treatise in which he described comedy as producing happiness, the ideal state. During the medieval period, translations of Greek and Latin literature produced the modern interpretation of the word “comedy.” Shakespeare wrote many plays that were comedies, ones with ribald elements, mistaken identity, and ultimately happy endings. The works of Kurt Vonnegut, Jr.
Shakespearean Tragedies - Order a new and original research paper on any or all of Shakespeare's Tragedies. Shakespearean Tragedy Plays are Paper Masters specialty. Medieval Times - Medieval Times Research Papers examine the time period that took place between the fall of Rome and the beginning of the Renaissance. A Middle Ages - Research papers cover the time-period between 500 to 1500AD and includes the early Renaissance period. Comedy of Errors - Custom research papers on William Shakespeare's Comedy of Errors. Shakespeare Plays - Custom research papers on Shakespeare's Plays. Comedy of Errors - Comedy of Errors is one of William Shakespeare's better known plays. Order a research paper on Comedy of Errors from the source for college English essays. William Shakespeare - William Shakespeare research papers examine the life of Shakespeare and his work. William Shakespeare's Monologues - Shakespeare also wrote monologues into his comedies and histories and for both men and women characters. Biography of William Shakespeare - Order a research paper on the biography of William Shakespeare. How to Write a William Shakespeare Biography - Use this outline for a William Shakespeare research paper or create your own on Shakespeare. Tom Jones - Tom Jones research papers explore Henry Fielding's 1749 novel Tom Jones, which many critics identify as one of the most important texts of 18th Century. Symbolism in Catch-22 - Joseph Heller's Catch-22 is a satirical novel that critiques unregulated capitalism and the power and control exercised by modern bureaucracies. Dante's Divine Comedy - Dante's Divine Comedy term papers examine the allegorical tale about Dante's Work. 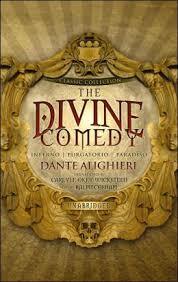 Divine Comedy - Divine Comedy research papers examine the epic poem from the Italian Renaissance. Undiscovered Country - This paper will discuss the way in which this motif is treated in two great literary works, Homer's Odyssey and Dante's Divine Comedy. Much Ado About Nothing - Much Ado About Nothing research papers on the Shakespearean comedy. Greek Tragedy - World Literature research papers explore themes in Greek Tragedy. Convivio - Convivio research papers are literature based and discuss the work by Dante. The Bear by Anton Chekov - The Bear Anton Chekov research papers examine the comedic one-act play. Paper Masters writes custom essays on Comedy in Literature and examine pieces of literature that contain humor intended to produce laughter.